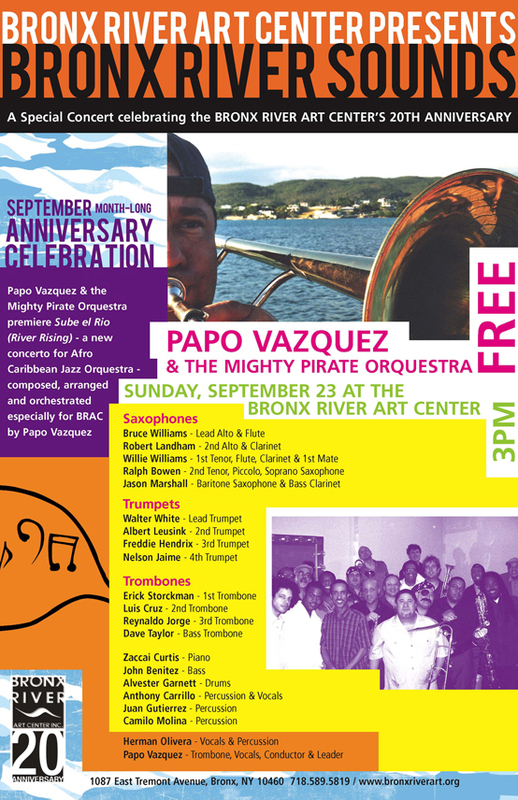 The 3rd event in BRAC's month-long 20th Anniversary Celebration, and the final concert of 2007 Bronx River Sounds, a music series that includes commissioned works inspired by the Bronx River. Trombonist, composer, and arranger Papo Vazquez is an innovator of three important musical movements in the history of contemporary music. First, Papo was a founding member of a group of musicians that began a resurgence of Afro-Caribbean Jazz in New York during the late 1970’s, which included Jerry Gonzalez, Hilton Ruiz, and Dave Valentin, among others. After moving to Puerto Rico in 1980, he co-founded Batacumbele – a progressive and influential modern band in the history of Puerto Rican music. He later established the group Papo Vazquez Pirates Troubadours. Recently, Papo Vazquez created a new suite of compositions for a 20-piece Afro-Caribbean Jazz Orchestra, named the Mighty Pirate Orquestra for his hometown of Philadelphia. In the same spirit, Vazquez has composed a new piece entitled Sube el Rio (River Rising) that has been commissioned by BRAC for this special performance.